When it comes to PC devices like RAM’s, Storage Drives, Headsets etc, Kingston is a brand that pops immediately in your mind. They have constantly made great quality products which are durable and at a competitive price. We previously did a review of Kingston’s SSDNow UV300 240 GB SSD. This SSD was aimed at the budget segment and it did impress us a lot. Kingston, at CES 2017, showcased its new range of SSD’s with capacities of 120GB, 240GB, and 480GB respectively. They sent us the Kingston A400 240GB SSD. Based on our experience with the UV300, we were quite excited to test this one. So we went with our test and here is what we found out. The A400 SSD comes in a plastic cover with the SSD completely visible. On the package, there is the Kingston branding along with the SSD capacity and a 3-year warranty boldly printed. This clearly shows the amount of trust Kingston has on its flash technology and is not afraid of betting big on it. Open it and you get the SSD itself. There are no other things or documents with it. This helps a lot in price cut which is beneficial for end users like us. 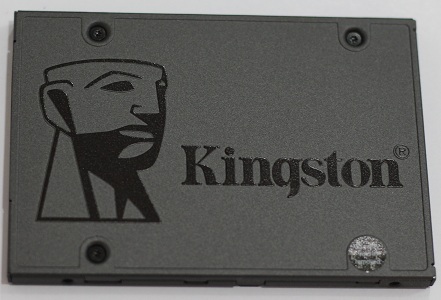 The SSD is 2.5″ and comes in gray color with Kingston branding. It is 7mm thick and extremely light weight. The best thing about the A400 is that it has a textured aluminum case. You don’t get that even in premium SSD’s. This case makes sure that the build quality is great and durable. We installed this drive as our main storage drive in our PC. It fitted in perfectly without any issues. We then installed Windows 10 using a 2.0 pen drive. Needless to say, 2.0 port was the bottleneck which caused slow installation of Windows as it took about 11 minutes to install the OS. Then we installed our benchmarking tools like PassMark and AS SSD. We didn’t install any other software’s or essential drivers as we had less time for testing it. We then ran our benchmarks and below are the results of those tests. Just to be sure we got accurate results, we ran each benchmark 3 times and you can see all the results we’ve got. Below are the results obtained from PassMark benchmark test. Below are the results obtained from AS SSD benchmark test. 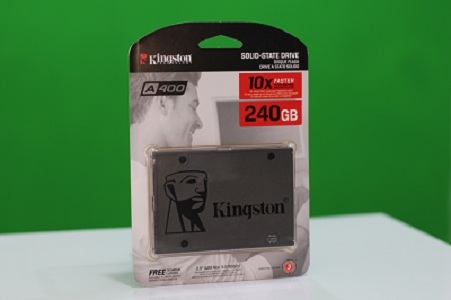 Kingston has rated the A400 at 500 MB/s read and varying write speeds. In our tests, as you can see, we got speeds of up to 450 MB/s read and 400 MB/s write speeds. We think that we got lower speed because our system wasn’t optimized. You can expect a jump of about 30 MB/s speeds if you test it. Kingston, with A400 SSD, has again proved that it is capable of bringing out great products at very low price. Not only does this SSD has super fast speed but it also has a great build quality. I have no problem saying that this SSD will have a long life. At a price of Rs.7,311 on Amazon, it has placed itself right in the budget segment. Added with the fact that it has a great build quality and 3-years of warranty, it is one of the best SSD you can get in the market right now. Thanks for a concise, useful review. Passmark/Diskmark and AS-SSD are both representative of the performance we can expect in everyday use. Users who require high “steady-state” Write speeds will need to pay far more, but for the rest of us the Kingston A400 will provide quick, snappy results for all everyday work and games.